« The Kindle reader: how does it fare for historians? The National Archives of Ireland is soon to become an institutional casualty of the recession. A proposal to merge the National Archives of Ireland and the Irish Manuscripts Commission into the National Library of Ireland (note the preposition) was announced in October 2008. Draft legislation is now nearly complete. 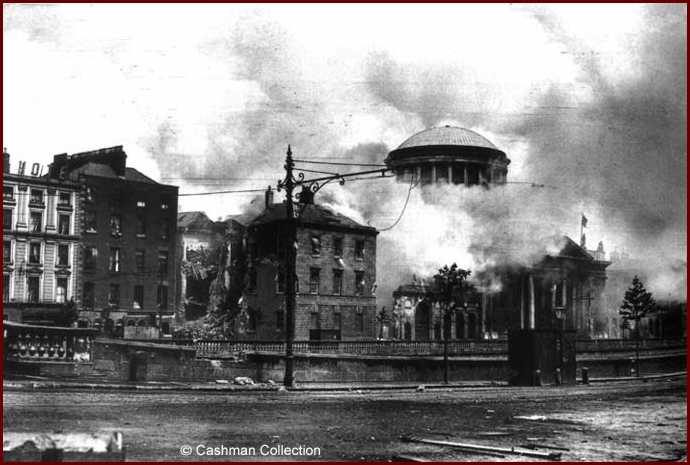 If the government moves swiftly, it may secure the passage of this ghastly proposal through the Oireachtas in time to mark the 90th anniversary of the Four Courts bombardment of 30 June 1922, which destroyed the old Public Record Office of Ireland, and with it the accumulated records of seven centuries. This is hardly the best way to commemorate the nation’s great archival tragedy. But is it possible to generate sufficient awareness to force the government to think again? When the merger was first announced, the attention of the public was understandably on bread-and-butter issues. Now the crisis facing the National Archives has gained some attention owing to the revelation that records from 1979 due to be released under the 30-year rule cannot be processed. This provoked a flurry of correspondence in the Irish Times. Then, on 20 January last, the crisis facing the archives was raised in the Senate. The exchange between Senator Fergal Quinn and Deputy Martin Mansergh, Minister for State with responsibility for the Office of Public Works (though not the Minister with direct responsibility for the Archives), repays close reading. The Minister conceded that the National Archives ‘suffers from a long-standing storage challenge on a constrained site’. He was quite clear, however, that major capital investment is out of the question and that the draft ‘legislation, of itself, cannot resolve [the storage problem]’. The Minister also stated that the issue merits a full debate ― something that has been lacking until now. This seems encouraging. Unfortunately a debate that takes place after the draft legislation has been published can scarcely hope to challenge the premises (excuse the pun) on which the proposal was based. It may be as well, then, to pre-empt some of the arguments in favour of the merger. Doubtless we will hear much about ‘best practice’. Canada ― a country that has a track record for getting things right ― is likely to feature prominently. Library and Archives Canada is a successful amalgamation of the former National Library and National Archives of Canada. But closer scrutiny of the Canadian case exposes the risks involved in the merger of our own equivalent institutions. First, National Library of Canada (established in 1953) grew organically out of the collection of the National Archives (established in 1872). The administration of the two institutions was highly integrated for the fifty years before their merger, and they shared the same (inadequate) building in Ottawa. The proposed Irish merger ― involving institutions that have been autonomous for centuries ― will be nightmarishly messy affair. Second, the Canadian merger was part of a grand strategy for securing the country’s documentary heritage, and it was done in 2004 at the height of the boom to the tune of $13 million. Only someone utterly committed to self-delusion could believe that the Irish merger springs from anything but the crudest economic motives. The government’s proposal is also out of kilter with attitudes towards archival preservation in the world at large. In 1992 the National and University Library of Bosnia and Herzogovina in Sarajevo was identified as an enemy target and bombed, destroying some 1.5 million books and rare manuscripts, as well as the national archive. It was partly in response that the UNESCO Memory of the World Programme was established to raise awareness about the importance of archival preservation. The message of the UNESCO programme is twofold: that the natural state of archives is to be imperilled; and that their preservation requires constant vigilance. In this context, it beggars belief that a sovereign government would, as a matter of policy, decide to jeopardize its nation’s documentary heritage once more. This entry was posted on 28 January 2010 at 07:05 and is filed under Archives, History in the news, Pue's Soap Box. You can follow any responses to this entry through the RSS 2.0 feed. You can leave a response, or trackback from your own site. Great piece on a vital subject! There was an excellent article by Fintan O’Toole about governmental attitudes to the National Archives in Saturday’s Irish Times, and the real problems facing them going into the future. Of particular concern here is not just the lack of interest but also the unwillingness to engage with the problems of archiving modern records. As O’Toole suggests collective amnesia may suit the government but does it suit the Irish public, let alone the historian! Collective amnesia, or finances? I don’t know, but I do know that this is not an issue well publicized abroad. I am sure that even despite our own financial woes in the U.S., there are institutions and/or foundations that would provide assistance. Quinnipiac University in Connecticut, for example, maintains a large library on historic documents and literature relating to Ireland. New York University maintains Ireland House and hosts an extensive Irish studies program. There is a large (and wealthy) Irish community living in mansions along some of New Jersey coastal areas, to the point where a community college there, Brookdale, has launched its own Irisih Studies program — something quite rare at the community college level. Also, there’s a huge Irish speaking population living in Nova Scotia, and resources at the University of Nova Scotia (where, dare I say, Peter Hart last taught). Has this avenue been approached? Rather than see these precious documents ruined because they’re not properly stored is tragic. Perhaps the university or some U.S. library schools could offer studies abroad for this purpose? Just thinking aloud, I supppose. I’d hate to be cynical and think there are things not meant to surface, but that it’s more a matter of cost. But sometimes I’m cynical despite myself.